Is your dog scratching more than usual? Or has he developed sores from constant licking and chewing? If so, he’s probably suffering from itchy and irritated skin. This is a common problem that can cause immense distress for a dog, so it shouldn’t be ignored. In this article, I’ll discuss some of the reasons your dog might have itchy skin, along with some tips for providing relief. There are many reasons a dog may suffer from itchy skin. While the eight below are amongst the most common, you should discuss excessive scratching, biting, licking or chewing with a vet. Dry skin has a variety of potential causes, such as nutritional deficiencies and mild dehydration. Dogs that live in low humidity environments are also more susceptible. It’s often obvious if a dog has dry skin, as there will be white flakes, cracked skin and itching. Your dog will also probably scratch whenever he’s touched. Food allergies are a common cause of itchy skin in dogs. Unlike humans, who sneeze or get a runny nose during a mild allergic reaction, dogs often suffer from itchy skin. The surprising thing about a food allergy is that it can develop at any time. A dog that’s always been fed the same type of food can suddenly develop an allergic reaction, as it’s repeated exposure that causes the immune response. Constant itching can also be caused by environmental triggers, such as pollen, dust mites and mold. Unlike food allergies, these allergies may cause scratching at specific times of the year. Fleas are a common parasite that love the warmth of a dog’s fur coat, and will continuously bite your dog’s skin. Aside from causing itching, this can potentially cause allergic reactions. Just because you can’t see fleas doesn’t mean they aren’t there. Fleas spend around 90% of their time away from the animal, as they lay eggs around the house, so you’ll often only notice them once the infection has become severe. Mites are another common parasite that can affect a dog’s skin. Unlike fleas, they are microscopic so can’t be seen by the naked eye. Their effects are often more noticeable, however, as mites cause severe itching, hair loss, sores and inflamed skin (this is a condition known as mange). On a related note, ticks may cause scratching of a specific area. Make sure you remove both the head and body at the same time, otherwise it could cause an infection. Dogs often scratch when they are stressed. This is most common during brief moments of frustration, such as when the dog wants to play or is waiting to go for a walk. For ways to prevent boredom and relieve anxiety through playtime and exercise, take a look at How Much Exercise Does My Dog Need Each Day? for some great tips and ideas. Severe anxiety can cause continuous itching though. This is a form of compulsive behaviour that can lead to red patches or inflamed skin. It’s vital that you discuss your dog’s anxiety with a vet, as compulsive scratching can cause severe damage in a relatively short time. An imbalance in your dog’s hormone production can make him more susceptible to skin infections. A drop in thyroid hormone, for example, may cause skin itching. Aside from scratching, you may notice changes to the texture or colour of your dog’s skin. Hormonal problems can usually be diagnosed with a blood test. Your dog’s diet can cause chronic itching if it’s lacking in key nutrients. Deficiencies in zinc, copper and omega-3 fatty acids, for example, can affect skin health. Nutritional deficiencies are usually caused by poor quality dog food. While switching to a nutritionally complete and balanced diet is the best long-term solution, supplementation can also solve the problem. Medical conditions that cause malabsorption in the gut can also lead to nutritional deficiencies. There are a variety of types of skin infections that can cause itching. A yeast infection, for example, often causes scratching and licking around the toes or ears. Other examples of skin infections include impetigo, which causes blistering, and folliculitis. Some breeds are more likely to suffer from genetic conditions that can cause scratching. This is often due to generations of inbreeding. One of the most common examples is the Cavalier King Charles Spaniel. Up to 70% of Cavaliers show signs of a condition called syringomyelia by age six, which affects the spinal cord. It can cause continuous itching due to damage to nerve fibres, ranging from a mild skin crawling to more severe burning. Treatment for skin itching depends on what’s causing the problem, which is why you should always contact a vet for advice. The good news is that most causes of scratching can be successfully treated once your dog has received the correct diagnosis. There are also many ways you can provide relief at home. Here are some of the most common treatments and remedies for itching. Several types of medications could help with skin scratching. If your dog suffers from allergies, for example, your vet may prescribe antihistamines or corticosteroids. These can provide quick relief - but don’t solve the underlying problem. 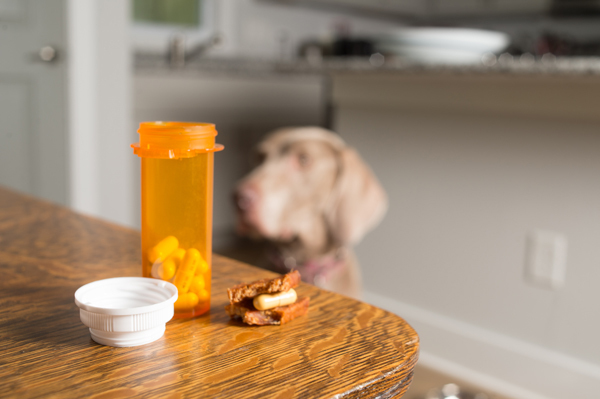 Long-term use of some medications can have an adverse effect on your pet's health, so talk to your vet about alternative treatments, diet changes and supplements that may limit the prescription medications required to treat your pet. For dogs with skin infections, antibiotics or other medication may be required. Switching your dog to a different food brand often isn’t enough to relieve an allergic reaction. Allergies are caused by a specific ingredient in the food, which may be present in another brand. Instead, you’ll need to switch to a limited ingredient food, preferably using a protein that your dog hasn’t eaten in the past. Your vet may also be able to suggest a prescription diet to limit possible allergens and triggers. If your dog’s scratching doesn’t improve on a low allergy diet, he may be allergic to something in his environment. An allergy test can sometimes help determine what’s causing the problem, but limiting exposure to allergens like smoke, perfumes and air fresheners may provide some relief. If your dog has fleas, start by giving your pet regular flea treatments. This should eliminate existing fleas and stop the itching. Flea eggs can survive for months though, so getting rid of an infestation can take time. You’ll need to treat all areas of the home, garage and car, along with other pets in the house. Mites are usually treated with an anti-parasitic shampoo. These can be bought from most pet stores, but it’s a good idea to contact your vet to get the right one. Some dogs may also need medication to fight a mite infestation. Relieving allergies caused by airborne triggers can be tricky. Pollen, dust mites and mould can lead to continuous scratching but are almost impossible to avoid. There are a few things you can do to limit your dog’s exposure though. Installing filters in your home, for example, can reduce the quantity of allergenic particles circulating in the air. Regular vacuuming using a vacuum with a HEPA filter can also provide cleaner air. Dogs need exercise, so you can’t keep them away from all allergens, but it’s a good idea to stay away from the worst locations. If your dog reacts to mould spores, for example, then avoiding damp woodland areas is important. While relieving your dog’s itching is the primary goal, sometimes you need to protect areas during the treatment process. This is particularly important if your dog is starting to develop “hot spots” - patches of skin that are red, painful and infected. There are several ways to discourage scratching or biting certain areas. Aside from interrupting your dog whenever he starts to scratch, you can use a special collar to make it more difficult to reach with his mouth. Your vet may also recommend covering the area with a bandage. Bathing is a great way to remove allergens that are stuck to the skin. Occasional baths can provide relief from airborne triggers and relieve scratching, while also getting rid of loose hair. 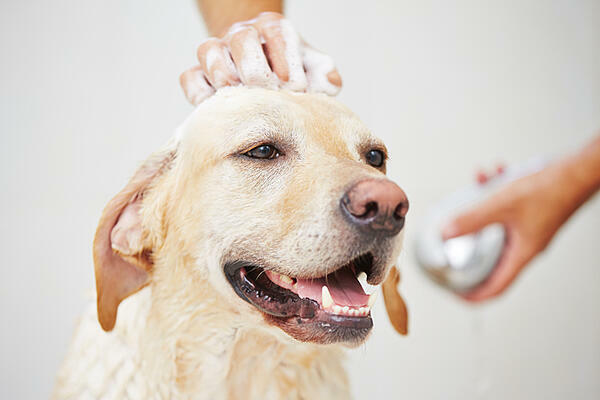 The problem is that many canine shampoos have a drying effect on the skin. This can lead to flaking and soreness, resulting in more scratching. Instead, use a moisturizing shampoo that leaves the skin soft and moist. Over-bathing can cause further dryness, try not to bathe your pet too often. You should also avoid blow drying your dog - especially on high heat. Towel dry the fur and let him shake the remaining water off naturally. A quick way to reduce irritation from environmental allergens is to wipe your dog’s paws and belly before going inside. This won’t remove all allergens but reduces the amount that enters your home. It can also stop your dog spreading allergens across his skin by scratching. Alternatively, dog boots and raincoats can prevent allergens from coming into contact with the skin. Some dogs don’t enjoy wearing these, however, so you may need to use positive reinforcement training to get your pet to accept clothing. Itching caused by inflammatory conditions can sometimes be helped by supplementing omega-3 fatty acids. Omega-3 has anti-inflammatory properties that can provide significant relief - and may even reduce the need for antihistamines. The dose required varies depending on a dog’s size, diet and breed. For this reason, you should discuss omega-3 with your vet before giving it to your dog. To learn more about Omega 3 supplementation, check out 10 Benefits of Omega-3 Fatty Acids in Your Pet’s Diet. 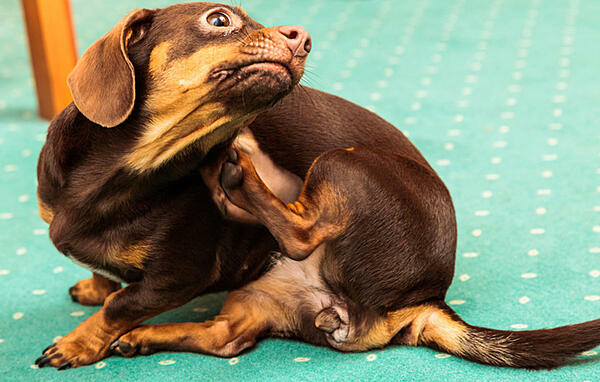 Skin itching in dogs can have a variety of causes. Food allergies and dry skin are two of the most common, but environmental allergies, parasites and genetic conditions can also cause itching. While most causes of itching aren’t serious and can be successfully treated, it’s important to visit your vet to get the right diagnosis. Treatment varies depending on why your dog is scratching, so it’s best to avoid extreme home treatments until you’re sure of the underlying cause. Richard Cross is a canine behavioural expert and editor of The Dog Clinic. When he's not researching or writing about dogs, he loves hiking the local countryside with his Labrador and Golden Retriever. To learn more, check him out on Twitter or Facebook.